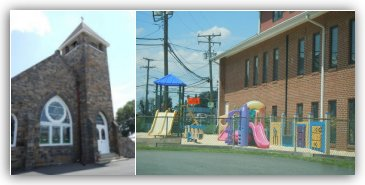 The FBC WEEkday Preschool is held in the Preschool Department of the First Baptist Church of Herndon, located on the first floor of the education building. The FBC WEEkday Preschool has approval for up to nine classrooms by the Town of Herndon's Conditional Use Permit #94-6. The maximum number of children permitted in the preschool at any one time is 98. We maintain an outdoor and indoor recreational area for the children. No more than 17 children are permitted to use either area at any one time. There are six (6) toilet stalls and five (5) sinks available for preschool use. The total square footage of the area is 3,936.50 square feet.